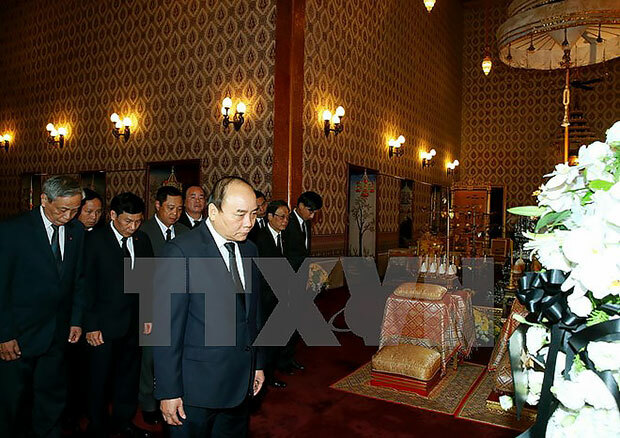 Prime Minister Nguyen Xuan Phuc and the high-ranking delegation of the Party and State of Vietnam paid respect to Thailand’s late King Bhumibol Adulyadej at Dusit Maha Prasat Palace in Bangkok on October 28 afternoon. The PM and the delegation of the Vietnamese Party and State laid a wreath in commemoration of the monarch. He wrote in the condolence book that the leaders and people of Vietnam always treasure the King’s sentiment towards the Vietnamese people, as well as his precious contributions to the friendship and strategic partnership between the two countries. On behalf of Thailand’s Royal Family, Government and people, the King’s Deputy Principal Private Secretary Chittrapat Krairiksh acknowledged the sentiment that the Vietnamese Party, State, Government and people give to the king. King Bhumibol Adulyadej passed away on October 13 at the age of 88. The Thai Government has set a mourning period of one year, and all entertainment events and festivities are also restricted for one month. To the Thai people, the late monarch is the symbol of national unity. His birthday is also the Father’s Day and the National Day. PM Phuc and the Vietnamese delegation left Bangkok for Hanoi later on October 28 on a commercial flight of Vietnam Airlines./.